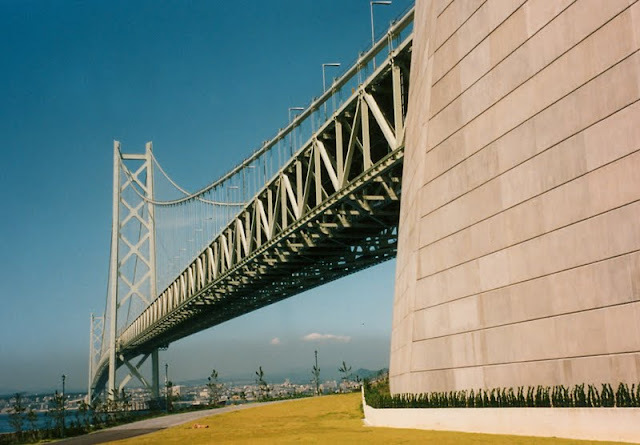 The Akashi Kaikyo Bridge has the world's longest main span. It was originally designed to be 1990 meters long. However, during the 1995 Kobe Earthquake the towers moved apart an additional meter, requiring a slight redesign to the unbuilt superstructure. The side spans are 960 meters for a total length of 3991 meters. Construction was completed in 1998. This bridge is superlative in every way. The painter's walkway (between the stiffening trusses) was designed to carry vehicles. Dry air is blown through the suspension cables to prevent corrosion. The 300 meter towers have tuned-mass dampers to reduce vibrations during high winds. The north anchorage is supported by a cylindrical diaphragm wall that was cast in the ground. The soil in the center was then excavated and the opening was filled with roller-compacted concrete. The towers are on steel caissons that were floated into position and dropped through the swift moving Akashi Straits. The bridge carries traffic between the west side of Kobe and Awaji Island. It is one of two long-span bridges on the 81 kilometer long Kobe-Awaji-Naruto Expressway. Suspension Bridges: Akashi Kaikyo Bridge by Mark Yashinsky is licensed under a Creative Commons Attribution 3.0 United States License.